You'll be £14.99 closer to your next £10.00 credit when you purchase HMS Victory. What's this? As is the case for many historic ships, however, there is a surprising shortage of informative and well illustrated guides, for reference during a visit or for research by enthusiasts - ship modellers, naval buffs, historians or students. This new series redresses the gap. No other books offer such superb visual impact and detailed information as the Seaforth Historic Ship Series – a truly groundbreaking concept bringing the ships of our past vividly to life. Nominated for the 2011 Mountbatten awards. 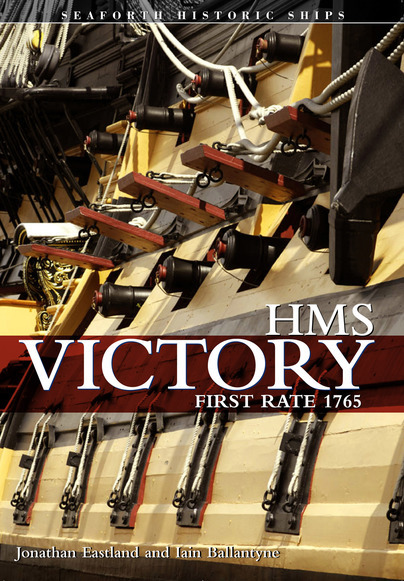 ★★★★★ First published in 2011, this entry in Seaforth’s Historic Ships series remains a vital resource and a wonderful tour of HMS Victory. This reprinting allows new readers to explore, learn about, and understand how important she was and is to maritime and naval history. Whether you’ve had the pleasure of visiting this grand lady and want reminders of what you saw, or just want to experience what she must have been like when her officers and crew walked her decks, HMS Victory: First Rate 1765 is a worthy treasure without a significant monetary sacrifice. It is a book you will savor and enjoy for years to come. Turned out as a complete surprise, very well written, well illustrated and superbly printed. I love it, it's an amazingly useful and handy book. Naval and non-naval modellers, dioramas and vignet builders, and any other type of modeller in general will find it of great interest. Most of the 128-page is devoted to a superbly illustrated tour of the vessel as she is today, from bow to stern and deck by deck, with significant parts being given detailed coverage, while a final chapter looks at Victory's restoration. Highly detailed, well illustrated and reasonably priced. In a precise and careful treatment, they cover the evolution of naval architecture, maritime warfare, and British strategy that led to the construction of the 100 gun ship-of-the-line, her early history, a brief look at her greatest moment, Trafalgar in 1805, and how she came to be preserved. A valuable book for students of the age of fighting sail, and a very apt gift for some young person. Slick and colourful…nautical enthusiasts will certainly want this book and others in the series. Jonathan Eastland and Iain Ballantyne have created a visually stunning and informative guide. This is an excellent book, very well illustrated. A first rate visual guide to the most famous preserved warship on the planet. The imagery has the "wow" factor. Superbly recorded in sharp detail and rich colour, this is a brilliant showcase. The supporting text tells an absorbing, but easy to read story. If you can't get to see HMS Victory in the flesh, this is the next best way to go aboard. This book is a first rate visual guide. The imagery has the 'Wow!' factor. Superbly recorded in sharp detail and rich colour, the pictures are handsomely composed by award winning photographer Jonathan Eastlan, making this a brilliant showcase for his talents. If you can't get to see HMS Victory 'in the flesh' this is the next best way to experience what it was like to go onboard an 18th Century ship-of-the-line. Almost unprecedented access onboard and the detail of the photography is exquisite. As one of the most famous ships in the world, HMS Victory has been caught on camera countless times. But Jonathan Eastland thought he could show Nelson's flagship in a new light. JONATHAN EASTLAND, the renowned maritime photographer and writer, has studied Victory for more than thirty years and taken photographs of every corner of her and of every aspect of her restoration during that period.